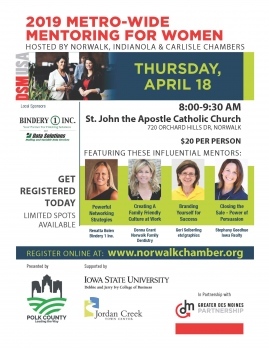 Calendar of Events - Indianola Chamber of Commerce. When: Monday through Thursday 6 p.m. - 9 p.m.
Track and Field House Available for Use by the Public. When: April 21 2 p.m. - 8 p.m.
April 22-28. Proceeds will go to support child abuse prevention programming in Warren County. Carry your groceries home in a paper bag decorated by Indianola Community School students. We’ve all had tough moments – when tensions were running high or when we weren’t “at our best”, and then a moment of misunderstanding, disagreement, or confrontation tipped us (or the person in front of us) over the edge into something ugly. Learn to anticipate and manage these tough moments with a little more grace so they don’t distract you or those around you. Interpersonal issues and disagreements in the office can affect the entire team; the spike in stress can make team members anxious, which means they’re worrying about what could go wrong instead of getting stuff done. Using techniques like unconditional positive regard and candor, we’ll help you and your colleagues get beyond the disagreement, so your team can stay healthy and functional. During this session, you’ll practice navigating through those tough moments, and learn valuable tools and techniques to get past the drama and get back to work. In this class, you’ll gain tools to have at your fingertips whenever you encounter conflict, and practice putting them to use. Our standard tools are reusable and customizable to help you with any situation you might face at the office, in the boardroom, and beyond, and this half-day course provides plenty of opportunities for practice and application along the way. Tired of others not demonstrating what you would describe as "common courtesy"? Stop holding others to standards you haven’t communicated, and learn to speak the unspoken, talk freely about our expectations, and reach a common understanding of courtesy. Workplace interactions require that we treat each other with the “right” level of politeness and decorum for the situation at hand. The problem is that we sometimes forget to define the situation in advance…which means that some of us are expecting one thing and others are expecting something else entirely. So while we each have our own definition of “courtesy”, we may not be working from a common understanding of what that means. With that in mind, this 45-minute webinar hits on some of the most common norms to help you and your team define your terms better. Join us for the Ed and Gary Show. You won't want to miss it...GREAT music and more! When: April 23 2 p.m. - 3:15 p.m.
Where: Vintage Hills of Indianola, 604 E. Hillcrest Ave. When: April 24 11 a.m. - 1 p.m. The Indianola Country Club's Women's Association presents its annual fundraiser: Administrative Assistant Salad Luncheon. When: Wednesday, April 24 from 4 p.m. - 7 p.m.
Where: A City-wide Garage Sale locating garage sales will appear in the Indianola Record Herald the Thursday before each garage sale weekend. How: Watch the Indianola Record Herald the first week of April for the Garage Sale form and payment information. Mark your calendars and make it a priority to #ThinkIndianolaFirst and SHOP LOCAL April 27, 2019.Grab your shopping buddies and plan to shop Indianola and the Downtown Square and around town 9 a.m. to 3 p.m.
H&W Recycling will be taking applications such as stoves, refrigerators, furnaces, water heaters, etc. When: April 27 10 a.m. - 5 p.m. When: Saturday, April 27th at 11:00 a.m. - 1:00 p.m.
Hamburgers/hot dogs, chips, drinks for $5 each with half going to your child abuse prevention programming. What a great deal we have for your Saturday Nights. We are teaming up with Sluggers Batting Cages and taking over their pitching greens for 2 hours every OTHER Saturday (except March 16). 2 sets of 18 holes (4 rounds) for $5. Tell all your friends. Share Share Share. The hauler will pick up refuse the same day as you recycling material. All items need to be on the curb at 7:00a.m. A fee will still be charged for disposal of any monitors/televisions. - Only large items not hauled through weekly service. -No construction materials or railroad ties. -Items that are bulky and difficult to handle, such as swing sets, must be cut up or dismantled into smaller pieces no longer than four feet. When: April 30 Noon - 1:00 p.m. When: Thursday, May 2nd from 5 p.m. - 8 p.m. When: May 4, 2019 from 11:00a.m. to 7:00 p.m. The Putt Putt and Pints event offers participants a unique golfing experience at local establishments and will help raise funds for a local charity. This year's charity is "Feeding Indianola's Kids". We offer peer-or professionally led groups for caregivers, individuals living with Alzheimer's and others dealing with the disease. Vintage Hills of Indianola has partnered with Indianola Good Samaritan Society to offer an Alzheimer's Support group in our community. This group meets on the first Monday of each month from 5:30pm-7:00pm. We alternate the location each month between Vintage Hills of Indianola and Meadow Glen Terrace ( Good Samaritan's independent living apartments). 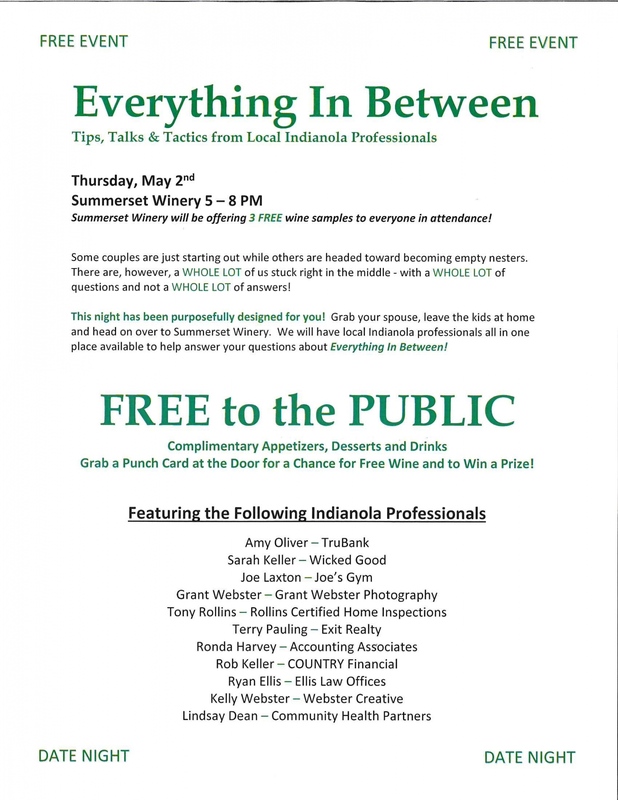 May's meeting will be held at Vintage Hills of Indianola. For questions please feel free to reach out to Danyel Wilson, Sales and Outreach Director at Vintage Hills of Indianola at 515-961-1924. When: May 8 8 a.m. - 9 a.m.
Do more with less! Designed specifically for those who are actively managing projects, this class is an in-depth look into the processes, knowledge areas, inputs, and outputs you need to know to manage projects effectively and successfully. Learn key knowledge areas and critical success factors now so you don’t have to learn them the hard way later. This class is a high energy, hands-on balance of PMBOK knowledge and application as well as best practices learned and passed down by the pros. Walk away with critical essentials for getting a project done regardless of size or complexity, as well as techniques, concepts, and tools that will save you time and energy in the future.